“Public education is the foundation of our democracy,” says Leslie Cooper of the Maricopa Community Colleges. As the institution’s general counsel, her passion for providing students with a standard set of competencies and exposure to the values of our democracy is a fundamental motivator for her work. One of the largest community college districts in the United States, Maricopa serves more than 220,000 students every year across ten colleges in Maricopa County, Arizona. It’s a task whose scope provides no small number of challenges for Cooper. However, by implementing new software and drawing from her legal background to modernize the contract process, Cooper is taking great pains to serve this population of budding citizens to the best of her ability. After stepping back and working part-time for a nonprofit, she was exposed to the advocacy and education work of public-sector lawyers, which brought her back to the fold. In 2010, she started working at the Arizona Attorney General’s office in the environmental section, eventually taking her current position at Maricopa in 2017. While she is passionate about her work at Maricopa, she understands (and even hopes) that her work as general counsel is invisible. “Ideally, the students wouldn’t know we exist,” Cooper says. Among the most important work she does at Maricopa involves maintaining compliance with the federal financial aid system, as well as enforcing Title IX protections to create a safe, productive environment for students. Cooper feels that her private practice experience helps her a great deal in these areas. “Private practice litigation teaches you to analyze deeply and examine facts carefully,” she says. Right now, Cooper’s biggest projects surround the updating of Maricopa’s cybersecurity practices and modernizing the contracting process. In 2013, the district suffered one of the first major cybersecurity incidents faced by a public institution, when a data incident exposed the information of thousands of students and employees. While no data was exfiltrated, it was “a wake-up call” for Maricopa with lasting impact—such that one of Cooper’s roles, even four years after the incident, was to help address the shortcomings in their system. Alongside a team of three strong senior associate general counsels, Cooper continued the evaluation of system flaws and addressing holes in their cybersecurity begun in the wake of the incident. However, these updates have a wider scope than mere data protection. Cooper and her team are also working to modernize contracts and then to further organize the vast amounts of data held by a ten-college district. With her team, she is currently working on a new contract system that, among other things, allows those requesting contracts to access the status of their contracts on demand. “They don’t need to rely on relationships, or hoping they catch the right person on the phone,” she notes. The team is also creating template contracts to minimize the amount of legal review. Maricopa deals with thousands of contracts a year, and this system streamlines the process, according to Cooper. “There are too many contracts to responsibly see without technology,” she says. As these changes continue to roll out, and Cooper settles more into the work environment of Maricopa, she grows increasingly proud of the organization–especially its higher proportion of women in high-ranking positions. 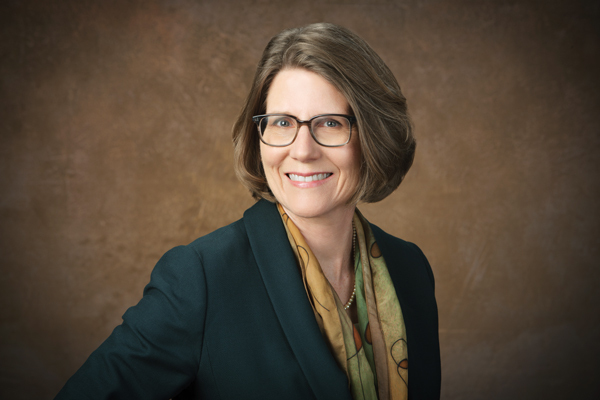 Maricopa’s District Chancellor, provost, and many of its college presidents are women, and Cooper runs an all-female team of lawyers. “It’s a dramatic change from the world I entered in 1986,” she says. “It’s good to experience the benefits of the work of women, such as Sandra Day O’Connor and Ruth Bader Ginsburg, who braved law school in the fifties only to be told they would hired as secretaries and paralegals.” Now, Cooper is proud to follow in the footsteps of these groundbreaking women, and to help pave the way for the next generation through educational opportunity. Headshot: Duke Photography Inc.; Banner image, courtesy of Maricopa Community Colleges.